Interesting facts, links, and suggested books for each month of the Civil War. 2 April. At Petersburg, Virginia, as the Union troops attack and Lee is forced to withdraw, Union major Clifton K. Prentiss and Confederate private William S. Prentiss are both wounded. They are brothers. They are taken to the same hospital and both die there. 2 April. Sitting in church, Jefferson Davis is handed a telegram by an orderly. "My lines are broken; Richmond must be evacuated by midnight. [signed] Robert E. Lee." Davis gets up and leaves the service. He and the cabinet will leave tonight for Danville, Virginia, as the capital city panics around them. 9 April. General Robert E. Lee surrenders to General U. S. Grant at Appomattox, Virginia. Parole is granted to 28,231 Confederate soldiers. Retreating to Appomattox, the men of Co. A, 1st Regt. N. C. Artillery are told to bury their guns and burn the gun carriages. Having done so they don't stay around to be officially paroled, but take their horses and head home to Lincolnton. A sidelight: Back in 1861 the First Battle of Bull Run is fought on the farm of a man named Wilbur McLean. (A year later the Second Battle of Bull Run also took place there.) Understandably Mr. McLean decides to move to a quieter neighborhood, the village of Appomattox. Now, in 1865, he finds himself once again in the middle of a battle and the final surrender is signed in his house, thus earning him a (probably unwanted) place in history. His comment is, "The war began in my front yard and ended in my parlor." 9-26 April. 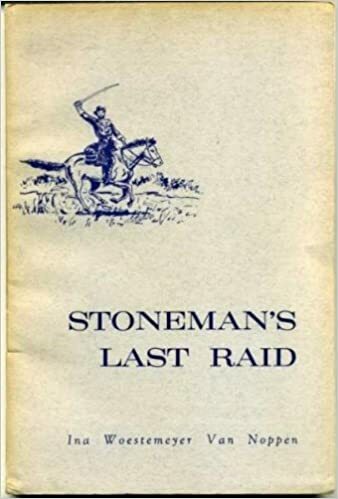 Stoneman's raiders swing back into North Carolina and down into Winston, Salem, and High Point, destroying textile factories, more railroads and bridges, and supplies as they go. 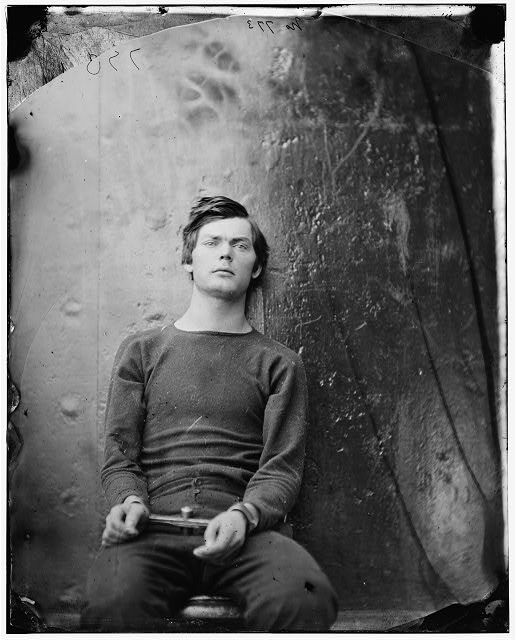 Stoneman's main personal objective is to free the prisoners at Salisbury, but the prison has been evacuated by the time he reaches that town on April 12. The raiders burn the prison and tons of stored supplies in a fire that can be seen for 15 miles. They then turn back towards Tennesssee, going through Statesville, Lincolnton, Lenoir, and Asheville. The cotton mill at Factoryville near Lincolnton is burned although the Union officer first tells the workers to take all the cotton they can carry to their homes. Traveling more than 600 miles, the raiders have accomplished their mission -- to bring the reality of war to North Carolina. At Charlotte, H. Ashton Ramsay, commander of the Naval Yard, is ordered to evacuate as much of his stores and equipment as possible on the train to Lincolnton. 13 April. Union troops occupy Raleigh. 14 April. President Lincoln is shot at Ford's Theater. 14 April. Fleeing Richmond, President Jefferson Davis and other officials arrive at Greensboro, North Carolina which becomes, for 5 days, the center of Confederate government. 14 April. At Fort Sumter, General Robert Anderson, who had surrendered there at the start of the war, raises the same flag he had lowered 4 years earlier. 14 April. Sherman receives a letter from General Johnston requesting a meeting. 15 April. Sergeant W. H. Andrews of the 1st Georgia Regulars [see September 1864] is in North Carolina. He writes, "We learned here for the first time that Gen. Lee's army had surrendered to Gen. Grant on the Appomattox the 9th day of April and were paroled on the field and allowed to return home. We found it out by seeing some of Gen. Lee's men on their way home. The announcement ruined the morale of Gen. Johnston's army, as it was nothing more than a howling mob after that." 16 April. Retreating from Bentonville, a number of North Carolina soldiers camp near Chapel Hill. As a strong thunder storm blows away their tents, Sylvanus Froneberger "took refuge under a large leaning oak tree about twenty feet in front of our tent in plain view. He had just taken his position when the lightning struck the tree and he fell dead. His heavy woolen sock was split wide open but the shoe left apparently uninjured." Sylvanus, who had enlisted at 17 the previous May, had survived 11 months of battle only to be killed on this last day of the war. 16 April. Colonel William J. Palmer's brigade, including the 15th Pennsylvania Cavalry, is detached from Stoneman's force. They occupy Lincolnton and "scout down the Catawba River toward Charlotte." 17 April. Brigadier General John McAllister Schofield, who is in charge of the Union occupation of North Carolina, issues his General Order stating that "for us the war is ended". 17 April. Troops under General Smith D. Atkins occupy Chapel Hill. Atkins and Eleanor Swain, daughter of the university president, outrage both sides by falling in love and carrying on a very public courtship. 19 April. Three regiments of Federal troops, part of General William J. Palmer's Brigade, are in Lincolnton. They receive orders to move down the Catawba to Charlotte. Camping in the courthouse square at Dallas in Gaston County, one soldier scrawls his name and opinion of rebels in a deed book. 24 April. The last meeting of the Confederate Cabinet is held in Charlotte at the Phifer house on North Tryon St.
26 April. At Bennett Place, North Carolina, Johnston surrenders all Confederate troops in the Carolinas, Georgia and Florida to Sherman; that's 89,270 men. 27 April. The steamship Sultana explodes on the Mississippi River near Memphis. In what is still the nation's greatest maritime disaster an estimated 1800 of her 2400 passengers die. Ironically, many of these men on the desperately overcrowded ship are Union soldiers who have just been released from a prison camp. Already in poor shape, they die of burns or from hypothermia in the cold river waters. Call Number: FIC HUM N.C. While Humphreys has been justly praised as a writer with her fingers on the pulse of Southern culture, she surpasses even her previous novels (Dreams of Sleep; The Fireman's Fair; etc.) in this spellbinding story of a largely forgotten remnant of Indians caught between opposing sides during the Civil War. Scuffletown, on the banks of North Carolina's Lumbee River, is home to the mixed-blood descendants of the original Indians in the area, desperately poor but hardworking families who eke out a living in the arduous turpentine trade. ... Most impressively, she illuminates a largely unknown facet of the Civil War, finding universal resonances in the suffering and quiet heroism of a beleaguered remnant of marginalized Americans. In its historically accurate delineations of the violence, greed and betrayal engendered by internecine conflict, and of corresponding bravery, sacrifice and heartbreak, this novel makes a powerful statement. Call Number: J DAH N.C. 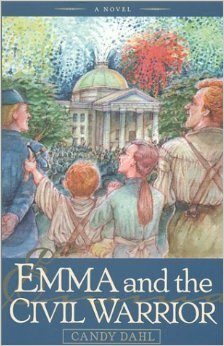 In April 1865 twelve-year-old Emma strives to help defeat the Union army in Raleigh, through various acts of smuggling, spying and stealing. After General Sherman's signal officer befriends her family, Emma struggles to accept the truths that the end of the war brings. 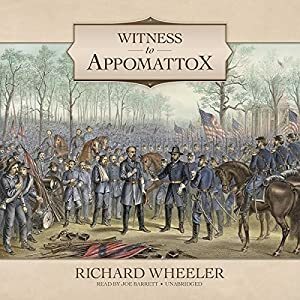 Wheeler links together the words of participants and eyewitnesses in a moving chronological narrative, this time covering the final three months of the Civil War. The accounts of fighting at Five Forks, the breakthrough at Petersburg, the evacuation of Richmond and the final skirmish at Sayler's Creek all point with solemn inexorability to the haunting surrender ceremony at Appomattox Courthouse on April 9, 1865. Wheeler does not confine himself to military operations, but provides a rich continuum of anecdotes conveying the growing sense of victory or defeat on the part of soldiers and civilians, along with homely details of daily life as the war winds down. The people and events of the last month of America's Civil War are described here lucidly and in great detail, making this an absorbing account of the final days of the conflict. Reflected in his approach is Winik's (U. of Maryland's School of Public Affairs) original premise for taking on the project: he wished to understand not only why and how the American Civil War ended, but the reasons that its originating conflict was thereby laid to rest, unlike other conflicts which continue to persist, for example in the Balkans and Northern Ireland. The Civil War ends, Greensboro, April 1865 : a historical study of the Civil War in Guilford County, by Bradley R. Foley, editor ; with Adrian L. Whicker, pub. 2008, 142 p., call #: 975.662 FOL N.C. Call Number: 973.782 BAR N.C.
At the end of the Civil War, spirited Ella Swain - daughter of the University of North Carolina president - shocked citizens across the state when she fell in love with and married the Union general whose troops occupied Chapel Hill. Author Suzy Barile separates fact from lore, drawing on Ella Swain's never-before-published letters that reveal a love that transcended outrage and scandal. The explosion and wreck of the Mississippi riverboat Sultana in 1865, which killed 1,700 passengers, mostly Union soldiers recently released from Confederate POW camps, is but the capstone of this engrossing survey of the many varieties of suffering in the Civil War. He fills in the backstories of four Yankee survivors. ... Making skillful use of war diaries and memoirs, the author makes these quieter ordeals just as moving as the Sultana's doomed voyage, with its "hellish scene[s] of hundreds of screaming people being burned alive" or drowning each other in panic.